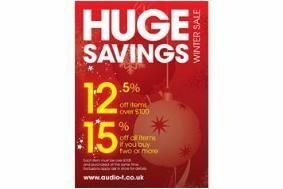 HOT DEALS: Audio T winter sale now on | What Hi-Fi? Please note that the above offers are not available from the Brighton, Cheltenham, Oxford, Epsom, Reading, Southampton or Tunbridge Wells stores, but are available online. There are more offers on the Audio T web store. Audio T has also extended its opening hours, with all stores open on Monday December 13th, 20th and 27th and some on Sunday 19th.